Anybody who knows even a little bit about the industry will be aware of Gretsch’s reputation as kings of vintage-themed models and masters of excellent hollow-body guitars, having made both for decades. These two are combined wonderfully with the G100CE Synchromatic Cutaway, which proves a very popular jazz guitar for guitarists who want authenticity at a price that doesn’t require you to sell a body part! If you were around in the 1940s – or have a penchant for vintage – the design of the G100CE will be familiar, as it is reminiscent of the early Synchromatic guitars of that era. This modern take features a full-sized arched top hollow body, made entirely from laminated maple and finished in an elegant natural urethane finish. While it is fairly simple in design, the G100CE still delivers the classic aesthetic that defines these timeless guitars. Of course, it shows all the trademark details you may expect, such as the finely contoured f-holes and the vintage floating tortoiseshell pickguard, all adding a nice retro touch to this lovely archtop. This is also true of the neck, which comes with vintage pearloid block inlays and white binding. This is a solid maple neck, with a sleek matte finish for a lovely hand feel, as well as a rosewood fretboard with 20 medium jumbo frets, which are accessible thanks to that generous cutaway in the body. For the midrange price tag, the fit and finish on this Korean-made model is on par and feels ready to go straight from the box. Traditional hollow-bodied guitars usually feature two pickups with a design that depends on the model. Gretsch did things a little differently with the G100CE, fitting just one Gretsch-designed single-coil pickup extremely close to the neck – an interesting choice, but one that ultimately pays off. The controls are equally as simple, with just a master volume and master tone control, offering more than enough versatility for this setup. As for plugging in, it sports a 1/4” cable jack on the lower bout. Elsewhere, Gretsch opted for a compensated height-adjustable rosewood bridge and custom chromatic tailpiece combination. Doing things this way keeps it in check with the aesthetics of other hollow-bodied guitars, as well as providing a pretty good performance in a price range where compromises are the norm. The chrome-plated diecast tuning machines feature an attractive vintage design, and work well at keeping the guitar in tune. Having just the single pickup may be enough to turn away a good portion of guitar players. After all, no matter how good that pickup is, having just one limits the range of the guitar, especially when it’s pushed so close to the neck. However, Gretsch has created a niche guitar that does a narrow scope of things, but does them very well indeed. With that classic ‘jazz box’ tone, it offers a rich and full sound, whether you are comping or taking the lead. Chords are smooth and mellow, while single notes sound well rounded and rarely thin. You can find some real twang too, depending on the strings you choose, so blues and rockabilly aren’t out of the question! While the G100CE Synchromatic has some limitations, Gretsch has limited the number of corners cut and have defined the purpose of this guitar straight away – a beautiful jazz guitar. It certainly looks the part, but plays beautifully too, with a gorgeous neck. The sound is perfect for jazz, but shows a little versatility providing you have a decent amp and appropriate strings. For the midrange price, it’s a guitar we’d happily play on stage week in, week out! More info about the Gretsch G100CE Synchromatic Cutaway, click here. 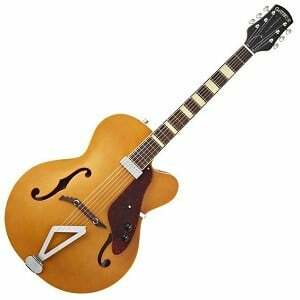 Bought one of these four years ago and it became my go-to guitar for jazz and country gigs. Sweet sound (yes, on the bassy side) and beautiful looks. When I need more high end I switch to a Gretsch 5420 with two pickups.